REGINA, May 16, 2018 /CNW/ - Input Capital Corp. ("Input" or the "Company") (TSX Venture: INP) (US: INPCF) has released its second quarter results for the 2018 fiscal year. All figures are presented in Canadian dollars. "Mortgage streams are the big news for this quarter at Input," said President & CEO Doug Emsley. We had been researching mortgages for a while, and we saw an opportunity to launch this new product to satisfy a clear need of our clients. This launch has gone better than expected, causing us to accelerate plans to add some term debt tied to mortgages and search out other avenues to fund mortgage deployment. "The next year will provide us with a greater feel for the depth of potential demand for mortgage streams. Early signs are excellent – without any significant promotion, Input's internal Investment Committee has approved over $23 million in mortgages in just three months. "Mortgage streams round out the Company's product offerings in a significant way and allow us to participate in a market where the vast majority of farmers' capital needs are found: land financing. 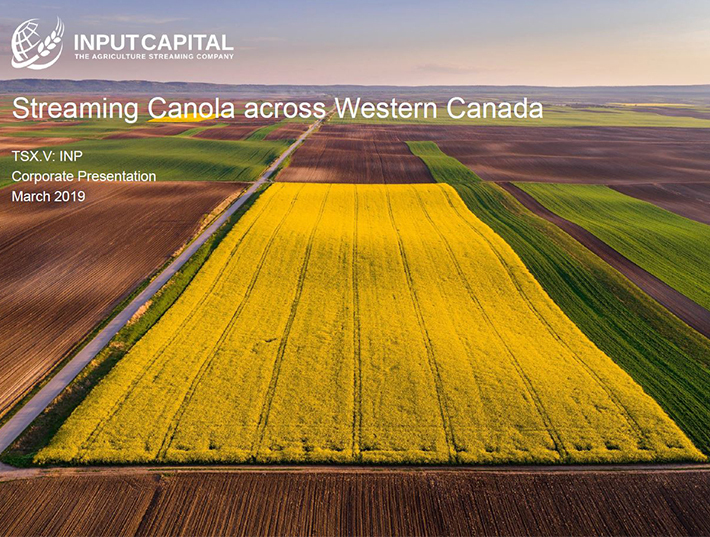 With working capital solutions provided via capital streams, canola marketing solutions provided via marketing streams, and a unique farmer-friendly mortgage solution via mortgage streams, Input is continuing to round out its product offering to farmers in a way that meets more of their needs." 1 Non-IFRS financial measures with no standardized meaning under IFRS. For further information and a detailed reconciliation, refer to "Non-IFRS Measures" beginning on page 35 of the MD&A. On April 12, 2018, the Company signed two term sheets for mortgage stream financing. These facilities will allow Input to margin mortgage streams and will be secured by the underlying conventional farmland first lien mortgages. From the start of the NCIB in December 2017 to the end of the second quarter, the Company had bought back 534,100 shares at an average price of $1.53 prior to the end of the quarter. These shares were subsequently cancelled. *Cash operating margin per tonne is significantly lower than the previous period due to the introduction of marketing streams last year. The most recent period includes marketing stream sales, and the previous period does not. Marketing streams feature lower cash operating margins than capital streams, but require significantly less capital to fund them. **The Upfront payment per tonne figure includes upfront payments into all types of streams. However, because the upfront payment associated with the grain delivery contract portion of a mortgage stream is $nil per tonne, this causes the upfront payment figure to be averaged down in the recent period compared to previous periods are prior to the introduction of mortgage streams. For the quarter ended March 31, 2018, Input generated adjusted sales from streaming contracts of $2.490 million on adjusted streaming volume of 5,159 MT for an average price of $482.66 per MT. The sales from streaming tonnes plus net settlements from streaming tonnes for the quarter represent a 73% decrease in quarterly volume over the comparable quarter one year ago, when the Company sold 18,992 MT of canola equivalent for revenue of $9.094 million for an average price of $478.83 per MT. This is a result of an early harvest accompanied by good harvest weather, which allowed for timely and smooth canola transportation and sale throughout the first quarter, translating into lower year-over-year sales in the second quarter of the 2018 fiscal year. The quarter ended March 31 is normally the period of the year when most capital streams are signed because farmers are preparing for the upcoming crop year and look to secure the majority of their financing for the year. For the three months ended March 31, 2018, Input recorded total upfront payments of $1.688 million into 67 streaming contracts for the right to purchase over 42,000 MT of canola over the life of the streaming contracts. In addition, $11.126 million was deployed into 18 mortgage streams. During the quarter, Input added 30 new producers to its streaming contract portfolio; 20 producers in Saskatchewan and 10 in Alberta. The remaining contracts were renewals, expansions and restructures of existing contracts. During the same quarter last year, total upfront payments made were $20.297 million and 60 new producers were added to the portfolio. Management believes that a good farming year in 2017 significantly moderated farmer demand for capital streams during the most recent period. Since the initiation of the Normal Course Issuer Bid, the Company has bought back a total of 534,100 shares prior to the end of the quarter at an average price of $1.53 per share. These shares were subsequently cancelled. Management of Input believes that the Company's shares have been trading in a price range which does not adequately reflect their value and that the purchase of shares under the Bid will enhance shareholder value in general. In last quarter's MD&A, we indicated that 2017 was a good farming year for most farmers in western Canada. Yields and prices were strong, harvest went smoothly, crop quality was good, and grain movement was not bad in many areas. As a result, strong cash flow reduced the need of farmers to turn to the Company to solve working capital issues, which is the focus of the Company's capital stream product. Capital deployment into capital streams was slow during the October to December quarter, and this continued into the January to March quarter. At the same time, canola prices rose during harvest and have remained strong since. This gave many farmers confidence in their own canola marketing programs this year, likely muting some potential uptake on marketing streams. In spite of this, the Company continued to grow its marketing stream book, adding a significant number of new clients in recent months. We are often asked whether strong canola prices are good or bad for Input, and like many streaming companies, the answer is "both". Strong prices contribute to the Company's returns on existing contracts, but can make it harder to acquire new ones. Weak prices reduce the Company's returns on existing contracts, but can make it easier to add clients to our client list. Management expects a quiet Q3 in terms of revenue because most of the 2017 canola tonnes have already been sold. The first half of Q3 has been busy with mortgage stream deployment, and the second half of the quarter is expected to be much quieter because farmers are busy farming. This provides management with an opportunity to prepare for the busy harvest and canola selling season which can begin as early as August and runs through the end of the calendar year. The Company uses these non-IFRS measures for its own internal purposes. These non-IFRS measures do not have any standardized meaning prescribed by IFRS, and these measures may be calculated differently by other companies. The presentation of these non-IFRS measures is intended to provide additional information and should not be considered in isolation or as a substitute for measures of performance prepared in accordance with IFRS. The Company provides these non-IFRS measures to enable investors and analysts to understand the underlying operating and financial performance of the Company in the same way as it is frequently evaluated by Management. Management will periodically assess these non-IFRS measures and the components thereof to ensure their continued use is beneficial to the evaluation of the underlying operating and financial performance of the Company, and to confirm that these measures remain useful for comparison purposes to other royalty/streaming companies. For more detailed information, please refer to Input's Management Discussion and Analysis available on the Company's website at investor.inputcapital.com and on SEDAR at www.sedar.com.